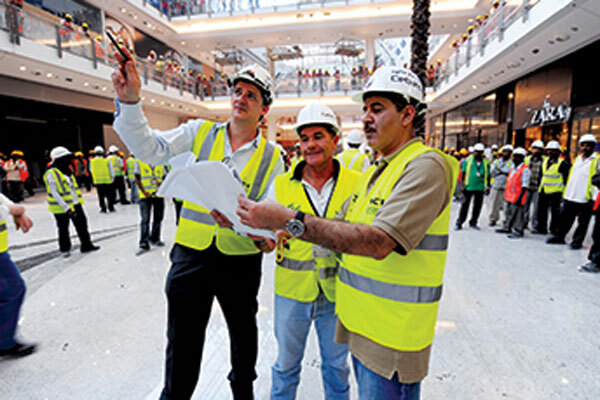 Hands-on CEO ... Abdulrahim at the City Centre Bahrain,br>project during its construction. Since its establishment 27 years ago, leading Bahrain-based building and civil engineering company Cebarco has evolved from a simple earthworks operation to a contractor of choice in the kingdom and beyond, with a portfolio of world-class, high-profile and complex construction projects worth many billions of dollars under its belt. Khalid Mohammed Abdulrahim, the chairman and group CEO of KAR Group, a diversified conglomerate of complementary businesses which includes Cebarco, is the mastermind behind this remarkable –and uniquely Bahraini – success story which has proudly made its mark on large, intricate projects such as the Formula One circuits in Bahrain and Abu Dhabi, as well as other vital infrastructure, real estate and leisure projects in the kingdom and overseas. Cebarco’s success over the last two-and-a-half decades is a confluence of factors. These include stable strong management teams, sound financial footing, a relentless focus on quality and safety and a policy of developing world-class capabilities and competencies in its workforce. Strategic investments by the KAR Group in the building materials and equipment supply chain also enable Cebarco to retain control over material costs, quality and delivery schedules for any given project. In 2018, Cebarco was able to further showcase its skills and capabilities as an AA contractor on some of the most challenging, and complex construction projects in Bahrain. The company currently has some BD240 million ($638 million)-worth of projects on its books and a three-year pipeline. Local highlights last year included the completion of a social housing public-private partnership (PPP) project, and construction of two highly specialised, multi-million-dinar data storage centres for an international client, an MEP (mechanical, engineering and plumbing) job of startling complexity with 10 x 2.5-MW back-up generators. At Diyar Al Muharraq, meanwhile, Cebarco will shortly complete primary infrastructure (PI) works, as well as a landmark deep gravity sewer (DGS) project involving the installation of a 1.2-m-diameter pipe 22 m below the surface. The company also made progress on a new amphitheatre for Bahrain’s Ministry of Works close to the Formula One circuit, while group company Kartec was called in to work on Phase Three of the BD12-million 400-kV project for the Electricity and Water Authority (EWA) on an accelerated timetable. Abdulrahim says another major highlight came in November when a joint venture between Cebarco Bahrain and Shapoorji Pallonji Mideast secured a contract from Eagle Hills Diyar, the masterplanner of the Marassi Al Bahrain waterfront development worth over $350 million. This is to build the 200,000-sq-m Marassi Galleria shopping and entertainment development, plus the luxury Vida Hotel and serviced residences, following a meticulous selection process. Abdulrahim says the joint venture with the Indian conglomerate is the latest in a long line of strategic partnerships that Cebarco has built with international firms to deliver large and complex projects. “Shapoorji Pallonji Mideast have a pool of 60,000 people and a global supply chain, and this resource will add value to this project,” he comments. Abdulrahim notes that 2018 saw KAR Group also invest in new machinery, as well as the refurbishment of workshops, stores and other logistics facilities, for Cebarco, while the company’s electromechanical division was also further equipped to take on additional and more complex work, including approval to work on 400-kV powerlines in Bahrain, the largest capacity in the country. Going forward, Abdulrahim is bullish about Cebarco’s prospects, given the company’s long-standing competitive strengths, as well as the inherent health of Bahrain’s economy. In a September 2018 update, the kingdom’s Economic Development Board (EDB) noted that the 6.7 per cent year-on-year construction sector growth in the second quarter was the fastest of any sector. The EDB added that the GCC Development Fund would continue to be a growth driver for the sector. “There is more competition from both local and international companies chasing less work in Bahrain,” the chairman acknowledges. “But that gives us the opportunity to challenge ourselves, keep reviewing the efficiency of our operations, and use our detailed market knowledge to capitalise on our solid track record and reputation,” he explains. “However, the opportunities are clear, and I’m really impressed with the way the Bahrain government is managing the economy. Work continues to come through from the previous Marshall Fund, and overall our tenders department is rejecting work because we are at capacity. “Contractors that have strong capabilities and financials, such as Cebarco, are thriving. We are currently seeing natural wastage in the construction market, and the overall quality is improving as a result,” he adds. Abdulrahim says the decision by Cebarco to establish a new infrastructure division 18 months ago with specialist competencies is already paying dividends. The division is on the verge of completing the PI and DGS works at Diyar Al Muharraq, as well as Dilmunia Phase Three (after successfully completing Phases One and Two). The division is also currently bidding on the Tubli Sewage Treatment Plant expansion Phase Four; the design-build contract for a control centre for EWA; and a new conference centre in Sakhir. Large new infrastructure projects are also on the radar in the medium term, including King Hamad Causeway, Bahrain’s metro system, new independent water and power (IWPP) and independent power plant (IPP) schemes, the ongoing Bapco Refinery modernisation, as well as areas such as renewable energy. “My strategic priority in 2019 is to further grow KAR Group and Cebarco, and look after our 2,000-plus people,” says Abdulrahim. “As well as Bahrain, we see Saudi Arabia as a key market for special projects such as Neom, which will create huge opportunities for qualified and capable contractors like Cebarco. We see the recent announcement by Riyadh of a seven per cent increase of spending in the 2019 budget to a record $295 billion (SR1.1 trillion) as a really positive sign,” he adds. A move into new overseas markets will hold no fears for a company whose track record includes its iconic Abu Dhabi Yas Marina circuit project, plus the 200-million-euro ($227.4 million) Trilogy Limassol Seafront development currently being built in Limassol, Cyprus. As a leading contractor, Cebarco will, however, have to navigate structural changes in the regional construction market, for example in the way projects are financed. When the region’s first-ever PPP financing scheme for social housing was arranged five years ago in Bahrain, the Cebarco chairman said that PPPs ‘could usher in a new era for the construction industry, especially in affordable housing’. Abdulrahim says PPP remains a viable model. Looking forward, Abdulrahim urges the Bahrain government to ensure qualified local contractors can have greater involvement on overseas-funded national infrastructure projects in future.